If you want to know about the process of making maple syrup and the history behind maple sugaring this is the workshop for you. Learn how to tap a tree, collect buckets, and see the sap flow from the tubing. To finish the day join us in the sugar house for sap boiling and a sample of the pure maple syrup. The program includes a Pancake Meal Service with real Maple Syrup! $20 per person with 15 person minimum or a maximum of 65 people. It is limited to March and April. We do have grant money to cut your costs in half for 2017. ​Check out this excellent Maple Syrup lesson from PBS's This Old House! This year, Maple Weekend will take place in March and will last 10am – 4pm each day. New York State maple syrup has established a reputation as one of the highest quality maple syrups in the world. 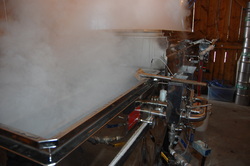 Maple Weekend allows New York Maple producers to demonstrate the superiority of their product, and invites the public to sugarhouses to try for themselves. For more information about Maple Weekend in New York, go to www.mapleweekend.com .